Use Voip for STD and Local Calls in India : Save Money | Free Pc to Phone Calls, Free Voip Calls to India International ! We have been quite active in recommending people living in USA and Canada to use Voip for making international calls to India. We have also posted about voip services for making international calls from India to other countries worldwide. 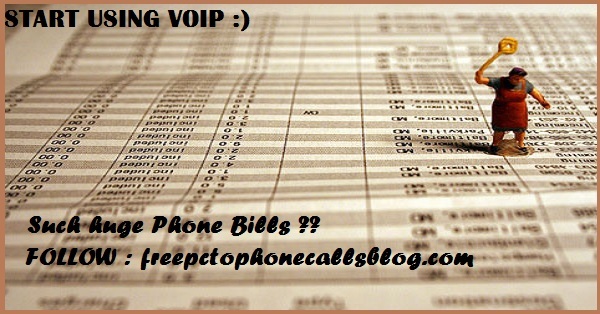 But have you ever wondered if it is feasible and profitable to use voip for making STD (national) and even local calls. People is US and other western countries have been using voip services for local, national and international calls (for quite a long time now). But why are we lagging behind. Will we save money if start using voip for STD Calls. Though voip services in India ain't much advanced, still using softphones for making PC to Phone calls is legal. You can also use mobile voip or any SIP devices for making calls directly from your mobile. In this post, we will be doing some analysis to figure out if it is profitable to use voip service for local calls. And when I say using voip for making STD calls, I don't refer to using Indian voip providers like MTNL, or sifytalk but actually I refer to those voip providers offering cheap calls to India. Let me come to the point. I live in Delhi and local mobile to mobile calls cost about Rs 1/min (2.3 cents/min) and STD calls cost about Rs 1.3-1.5 /min (3-4 cents/min). (These rates are for a normal mobile plan without any addon package). Though the above rates don't seem much costly but actually considering voip rates, there is still lot of scope for cost reduction. Now consider the rates by voip providers like Nymgo, Mediaringtalk and other cheap voip services. Nymgo offers a calling package (1750 min at just $19.99 per month), effective rates comes out to 1.13 cents/min (Rs 0.5/min). Mediaringtalk offers PC to Phone calls to India at just 1.9cents/min (Rs 1/min). By simply comparing voip and standard calling rates in India, simple maths shows that you can save lot of bucks if you use services like Nymgo and Mediaringtalk for making your local and STD calls in India. Even if you choose a pay as you go option like Rebtel (offering 1.5 cents per min), then also you will be saving lot of bucks. After we wrote this post, one of our blog readers mailed us asking some questions. We thought these are quite relevant so answering them here itself. Q. These services are PC to Phone. I prefer phone to phone. And what about voice quality. Ans. About voice quality of Nymgo and Mediaringtalk, let me tell you it is good. These are quite known service with good customer support. Yes these are PC to Phone, but you can easily get Nymgo SIP settings and use your SIP device for making Phone to Phone calls. If its possible for you to use PC to Phone calls, then its just great. However there are many other voip providers (phone to Phone calls) offering cheap calls to India. You can try them. Q. Should I go for voip for my STD and local calling needs..? Ans. If you are a business guy, making lot of calls each month then Nymgo is best for you (monthly package) but if you make less calls each month then you can go for Mediaringtalk (1.9cents/min) and if you make very less calls each month then you should remain with your mobile service provider only (for your calling needs) and wait for the time when voip calls in India become free (or try those offering free calls to India). Update: The time has come when you can use smartphone applications like Viber and start making free local and national calls. Guys do share your views about the above plan, What do you think should we Indians start using voip for making Local and STD calls....?